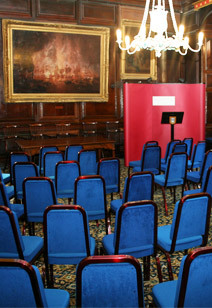 Trinity House is available for hire for corporate or private functions. Its main rooms are variously suitable for social gatherings, business presentations, conferences, committee meetings and private celebrations. The House has also featured regularly as a film location. The beautiful Banqueting Hall is understandably the most popular venue and will comfortably seat sixty-four for a meal, with a range of table options possible. A standing gathering, such as a buffet reception, can number up to eighty guests. A seated presentation will accommodate up to seventy, with several theatre-style layouts possible. The quietly imposing Board Room will nominally seat fourteen, but additional seating can be provided and this room is particularly suitable for meetings and interviews. The Master’s Room is suitable for small private meetings and as a break-out or anteroom. Under certain circumstances, the courtyard is also available for functions. Please note that the Brethren’s chapel is not available to the general public for religious services. While the Newcastle upon Tyne Trinity House does not itself provide catering, we will happily recommend a short list of carefully selected caterers and vintners, who are renowned for providing a high standard of both produce and service commensurate with the surroundings and are used to working in Trinity House. Other suppliers will be considered on application. All arrangements must be approved by the Newcastle upon Tyne Trinity House in advance, but contracts to supply are strictly a matter between the service provider and yourselves. If you are unfamiliar with the House, we strongly recommend that you visit to view the facilities and discuss your ideas with us. If you wish to arrange a visit, or wish to progress an enquiry, please contact us as shown below. We will endeavour to meet your needs and provide for a memorable event for you and your guests.